For better or worse, names create an immediate impression, which is why some people love and others change them. So what about the names we give our dogs? As humans, our names are a precious part of who we are. Often it is the first thing that a prospective employer or new acquaintance will learn about us. For better or worse, it can create an immediate impression, which is why some people love their names and others choose to go by a nickname or go to the lengths of getting it changed. So what about the names we give our dogs? If you think about it, those names are not only a reflection of our dog and, perhaps, the immediate impression, including any residual stereotypes, a stranger will take away when hearing you call out, “C’mon, Killer.” If it is a chihuahua that answers your call at the dog park, it may elicit everything from laughter to a sigh of relief. If it is a Rottweiler, the reaction will more than likely be completely different, but call that same Rottweiler “Fluffy,” the perception changes. Why we name our dogs the way we do run the gamut from logical to nonsensical, with touchstones of every other emotional or logical variant in between. From the dog’s personal history to the way it acts or looks or reminds us of another animal (or person or object) we know, just like us, it often becomes a permanent fixture. 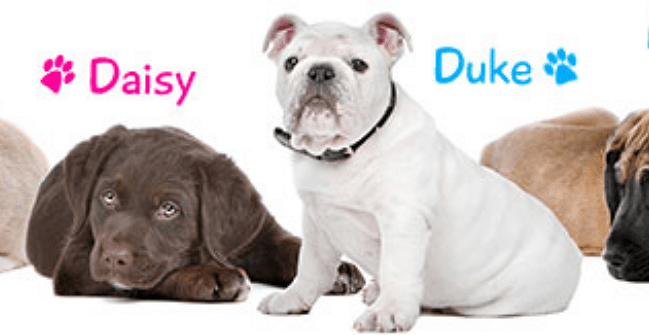 If you are in need of a dog name there are several different site through which you can cull to find the one that meets your expectations. Barkpost offers up it’s 20 Top Dog Names for 2016, alongside the rational, of primarily entertainment and social media-driven. The AKC has a list of the most popular and unique dog names, and points out that sometimes the obvious makes an impact. Consider the days of Peter Falk’s “Detective Columbo'” who at times was accompanied by “Dog,” his bassett hound. Zac Efron sort of went that direction by naming his dog, “Puppy.” The current Top 10 Trendy gender-based names including “Finn,” for males and “Elsa,” for females, is also shared. Unique Dog Names, Dogtime, and Rover (which also has a list of 70 unique names) all discuss the importance of name selection and provide a broad spectrum for consideration. Over at My Dog’s Name you can tick off certain styles or themes to help narrow down the choices. Clicking off “tough” and “funny,” provided boys names like “Porkchop,” and “Bullseye,” with the same for girls producing “Miss Havisham” and “Ursula.” My Funny Dog Names has, as might be expected, funny dog names, but also different categories like artists and historical figures. Sometimes it may prove harder than picking out that special dog from the shelter litter. Whatever you choose, naming your dog after a friend, family member, or musician (Bud, Roberta, Adele), favorite food (Taco, Pastrami, Cookie), vacation spot (Carmel, Vegas, Poughkeepsie), or thing (Wifi, Speedo, Skate), and however you spell it, Fido or Phydeaux, just remember this…some day you may have to yell that name out loud in public. Golden Retriever Heaven? See For Yourself! When we adopted our dogs they always had cute names, so there was no need to changed them.